Accept Credit Cards – Quick & Easy with Square (@square) – Food Truck Talk – Searching for the best foodtrucks! Square is a low cost credit card acceptance system that is perfect for mobile food operators who are looking for a portable, low cost, contract-free system to accept credit card. Square is a small credit card scanner that plugs into an iPhone, iPad or Android phone. There are no contracts, setup fees, merchant fees, customer service fees, variable card fees, or discount rate fees. Plus the Square reader is absolutely free. The fees that Square does charge are extremely competitive with more traditional credit card processing systems. Square charges 2.75% of each transaction plus a 15 cent transaction fee. As an example, on a $12 sale the total credit card fees would be 48 cents. That’s it, no extra fees. In situations where you do not have the credit card to scan you can manually enter the credit card information into the Square system. In these cases the fees are 3.5% plus a 15 cent transaction fee. This might be a good solution for those wanting to accept credit card for deposits or payments for catering or other pre-arranged functions. In most cases Sqaure will immediately transfer your money into your bank account or to your Fifth Thrid secured card! Square also keeps things organized for you with a variety of reports and information available via their very clean user interface. Square is paperless so all of your receipts will be in one place, and organized. 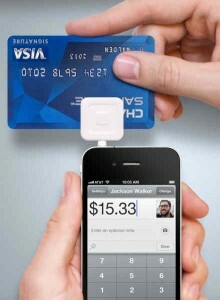 If you are not sure about accepting credit cards, or if you just want to try it out, contact Square. Download the Square App to your iPhone, iPad or Android phone, activate your account, wait a day or two for your free Square scanner to arrive and then starting accepting card payments immediately. When you use Square you will need to be in a location that has cell phone service. Square doens’t interfere with your using your phone, you can make/receive calls, Tweet, browse the web, and just use Square when you need to. Square was founded by Jack Dorsey, one of the founders of Twitter! Square is a no risk, low cost, no committment solution for accepting debit and credit cards! It’s like it was created with food truck operator in mind!